This is a picture of one of the more well-behaved samples between polarizers. The circles are 5CB droplets. The blurs of rainbow light are domains of aligned DSCG liquid crystal molecules, dissolved in water. Summarizing my work briefly is difficult. Having undergone two months of research at University of Wisconsin-Madison (under the University of Puerto Rico-Mayagüez's Soft Matter REU program), I find it difficult to imagine that such a long research experience merits anything less than a summary the length of War and Peace. I'm excited to share all I've learned, all I've discovered, and all I've done with my time with the world. However, the world does not need a 500-page description of my project. The world does not want a 500-page description, in fact. The public has things more relevant to daily life to read about than an epic description of the dynamics of active oil-in-water emulsions. 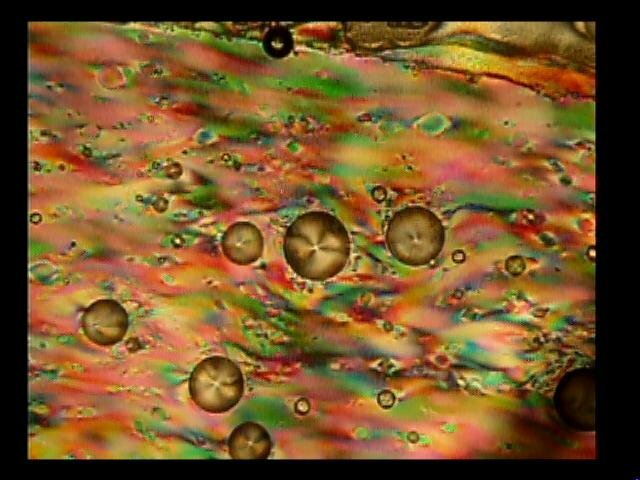 Most would be satisfied to know that I watched tiny oil bubbles move through water under a microscope. The research community has too much else to investigate to spend time reading a mile-long thesis on the intricacies of the interacting liquid crystal domains between the liquid crystal oil (5CB) and liquid crystal aqueous solution (DSCG in water). Most in the field would appreciate my basic characterizations of this previously uninvestigated system of liquid crystal oil (5CB), made active by the presence of surfactants diffusing around the surface of these oil droplets (SDS), in liquid crystal (LC) aqueous solution (DSCG in water). The engineering community has too much to build than to spend time looking at my many haphazard guesses at applications for these systems. Only a few in the field, if looking to create systems of fully-liquid microparticles whose motion can be confined to a particular spatial axis, might find my 5CB (oil) drops in DSCG (LC water) to be a relevant answer for further pursuit. After 5 full days of writing and editing, I managed to create a 20-page report summarizing my work. I realize that is probably too long, but I dread to consider the immense amount of time I would require to weed through the report and shorten it to the necessities. What stays, and what goes? Should I take out the 3-page description of Marangoni flow in the Introduction? I suppose a scientist in the field reading the report would already know about this phenomenon, or be expected to learn about it in a previous publication. However, I just find it so fascinating that, just like microscopic oars, the surfactants which rest at the surface of the 5CB droplets push the droplets forward as they move to the back to equalize their distribution on the surface of the droplet. I want to show everyone how much I know! Should I cut down on the nuanced discussion of my results? I suppose I could just say that the 5CB droplets preferred to move perpendicular across the alignment direction of the DSCG water, and that stronger alignments within the DSCG constrain the motion of the 5CB droplets. That would be the results in their plainest and simplest forms, but isn't it important to know all the intracacies and uncertainties of these results? Which ones to keep, and which ones to toss? If science cannot be communicated to other researchers and to the outside world, then it is no good. The brevity of the communication counts, too, though. People will be overwhelmed by the volume of information or focus on unimportant details if great care is not taken to condense scientific communication to the necessities. Knowing the necessities is difficult, of course, since the things that do not seem important might end up being the most important. Writing must be concise but also clear, which often requires spending more time describing something. I have struggled here to write "a shorter letter", and may have failed on both counts, having left out many important details for someone who is not already knowledgeable in this field and having typed for longer than most doctors would recommend you read about science. I will strive again, however, to strike that balance in the future. And maybe next time I'll even figure out a way to fit in the definitions of basic terms such as "liquid crystal" and what is meant by "active motion".